We have all been there. Waging that internal battle as we debate on what supplies to buy to make the next great handmade project. We all know that paper crafting is an expensive hobby because frankly, you can never have enough supplies. What if I told you that right now during SALE-a-BRATION, you can get, at minimum, $165 worth of product for only $135 and there wouldn't be any tax or shipping charges? What if I sweetened the deal and told you that after your initial purchase, you'd save at least 20% off every order you place? I know you're probably thinking, I don't want to run a business, I just want to craft. That's totally okay and completely acceptable with Stampin' Up! We have lots of hobby demonstrators who only join for the discount. Just knowing there is definitely a business opportunity to be had is all I ask. Have I piqued your interest yet? What if I told you there's one more thing that could make your decision even easier? 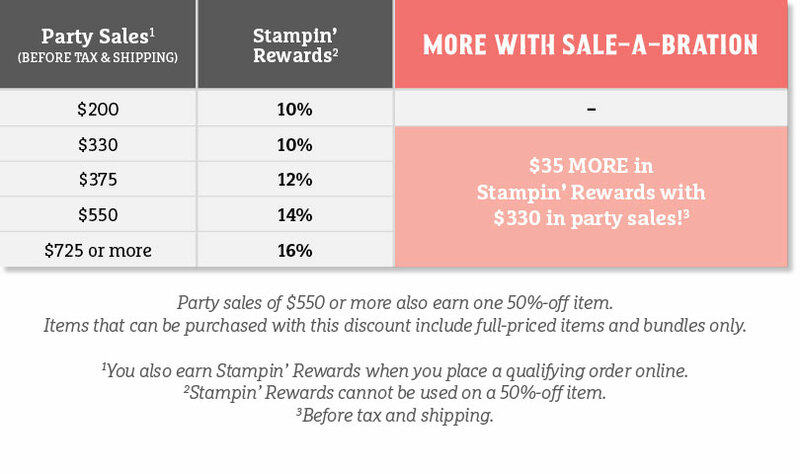 You can get you kit for FREE simply by hosting a party during SALE-a-BRATION. 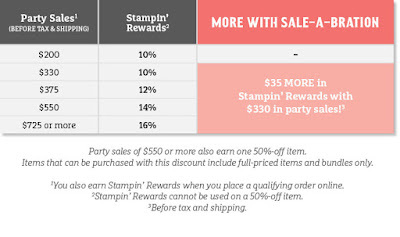 As a hostess, you can use your hostess rewards for FREE merchandise, or toward your demonstrator kit and earning the kit for FREE is that much easier during SALE-a-BRATION because hostess can earn MORE. Check out the chart below to see what I mean. If you'd like some more information, please send me a quick note. I'm happy to answer your questions.